The most important recommendation to come out of the third Section 809 Panel report on defense procurement reform is one that doesn’t directly relate to procurement, according to a leading industry group. 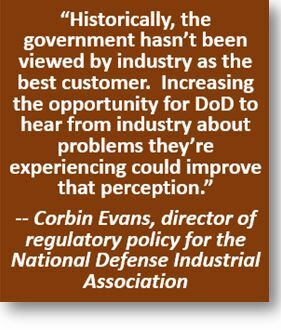 Corbin Evans, director of regulatory policy for the National Defense Industrial Association, told WashingtonExec the most crucial recommendation is for Congress to enact timely regular appropriations bills instead of continuing resolutions. Otherwise, defense acquisition will continue to suffer, regardless of what other reforms are made. Evans also singled out the panel’s recommendation to enable enhanced use of advanced payments at the time of contract awards to small businesses, which comprise about 75 percent of NDIA’s 1,700 members.